Anti-war march challenges McCain on last day of RNC | Fight Back! 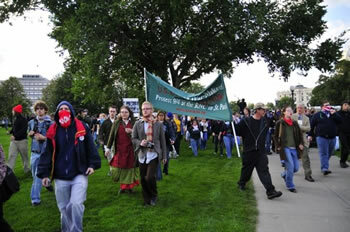 The march set off on the grassy area on the Capitol grounds and made it into the street, cutting over toward John Ireland Boulevard. 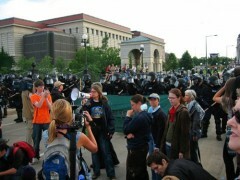 After arriving at the bridge that goes over Interstate 94, riot police scurried around and assembled on the other side of the bridge, blocking the protesters’ path. The front of the march hunkered down on the bridge, with about a hundred protesters sitting down in front of the police at the front of the march. In the back of the march, protesters held the intersection leading onto the bridge while riot cops assembled on two of the three sides of the intersection around them. After a while one set of riot police withdrew as protesters on bikes started circling the intersection, slowly claiming more space for the protest and preventing police from blocking the protest in as easily. At the entrance to the bridge the protest took on a festive atmosphere as people began chalking anti-war messages on the street and a group of protesters on bikes and skateboards rode around singing Solidarity Forever and other protest songs, while anti-war chants continued so the message of the march was clear. Returning again to Capitol grounds, the protesters then regrouped and attempted to turn back down John Ireland Boulevard heading toward the bridge where they had initially attempted to cross over Interstate 94 to get to the Xcel Center. 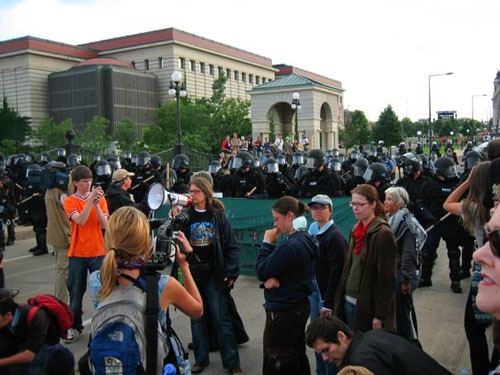 Marching in that direction, all routes leading down toward the Xcel Center were heavily fortified with riot police and the police even fortified some intersections with heavy machinery such as bulldozers and snowplows. Unable to continue down John Ireland Boulevard, the march turned right toward Marion Street, which police hastily blocked off in the direction heading toward the Xcel Center. So with all possible roads toward the Xcel Center blocked, marchers instead turned away from the Xcel Center, going right on Marion and heading toward University Avenue, a major Twin Cities thoroughfare. This seemed to confuse the police, and allowed the march to regroup, opening the possibility of either heading back to Capitol grounds, or taking a longer route swinging back toward the Xcel Center a different way. At this point it was getting dark outside. Marchers took over the east-bound half of University Avenue. 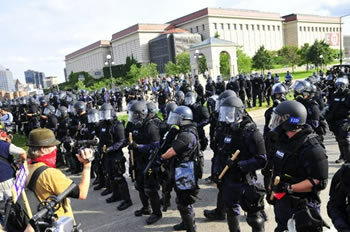 After marching a block to the east, riot police decided to take drastic measures to end the demonstration before McCain’s scheduled speaking time. They blocked marchers in front and behind, leaving no street to escape down, then began a fast flurry of teargas and concussion grenades. This sent the bulk of the marchers streaming into Sears parking lot, with others streaming from there across Marion into the McDonalds parking lot and onto surrounding neighborhood streets. Those that couldn’t get across Marion were rounded up in the Sears parking lot then blocked in on the Marion bridge. 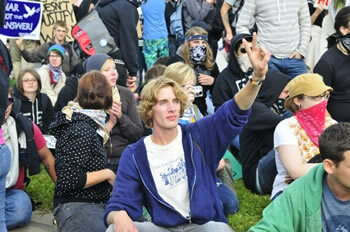 Over 100 more people were arrested one by one, bringing the total number of arrests for the whole demonstration to 396. This included arresting fifteen journalists who were covering the march.